Organize all your soldering equipment easily. Measures 14" x 15" x 6". Tools not included. Retractable handle makes transport easy. Made in the USA. TOP PICKS!! High quality solid state yet economical. UL listed. Has mounting brackets to attach to work bench. Organize all of your soldering tools in one place. Very handy to have. 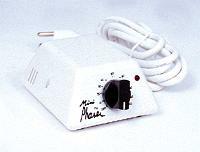 Includes electrical socket for your soldering iron, built in mini phaser, 6' power cord, soldering iron stand, tip cleaning sponge plus other mis. compartments. 1 year warranty. Will handle up 1800 watt. 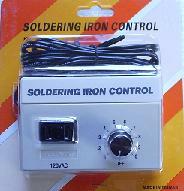 Includes rubber feet and detailed instructions for soldering lead using a controller.